In Germany, photovoltaic systems require feed-in management. To this end, ripple control receivers of the respective grid operators are installed. These ripple control receivers transmit a reduction signal from the grid operator whenever the system has to be throttled due to grid overloads. StecaGrid SEM is the easiest way to connect your StecaGrid inverter to the ripple control receiver. 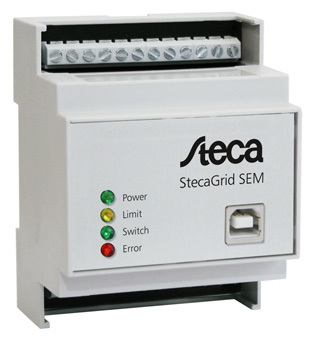 StecaGrid SEM evaluates the relay outputs of the ripple control receiver and transmits the signals via the Steca solar bus (or Steca RS485 bus) to the connected inverters. StecaGrid SEM can be installed in the switching cabinet right next to the ripple control receiver. The casing features a dimensioning typical for switching cabinets and can be mounted onto a top-hat rail. Its width is 4 HP. Direct power supply at 230 V. A mains adapter plug or an external direct current power supply are not required. All connected StecaGrid inverters can be accessed via a USB interface on the StecaGrid SEM. Connection to a PC is possible via a standard USB cable. The interface is on the front side of the casing – the cover does not need to be removed in the switching cabinet. As of firmware version 3.x, StecaGrid SEM offers additional functions: data can be read from an energy meter via a S0 interface. This allows for a distinction between the share of PV energy used at home and that fed into the grid. With this measurement data, StecaGrid SEM monitors the house connection and ensures that no more than 70% of the system‘s output is fed into the grid. If required, it accurately reduces the output of the connected inverters. Benefit for system operators: energy consumed at home is not included in the 70% limitation. The limit may be changed via the StecaGrid User Software and the USB interface on the StecaGrid SEM.